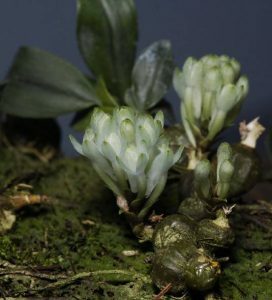 This enchanting creeping miniature was described by Tom Reeve from a collection at 2600 metres in Enga Province, Papua New Guinea in 1979. It is a mat-forming epiphyte with globose pseudobulbs. The paired leaves are often tinged maroon in high light. The flowers arise in clusters of up to 25 from leafless pseudobulbs and are ice-blue-green but sometimes cream or violet tinged. They can last for several months. A real gem. Price £22 plus £5 postage and packing.